Mobile applications probably consume more user’s mobile time as compared to their core features of voice and messaging. Over last few years, mobile users are increasingly using mobile phones for social networking, gaming & music. Infact, the recent increase in Smartphone mania has increased mobile app usage even further. Nielsen recently carried out a survey to find out popular Mobile phone Apps. 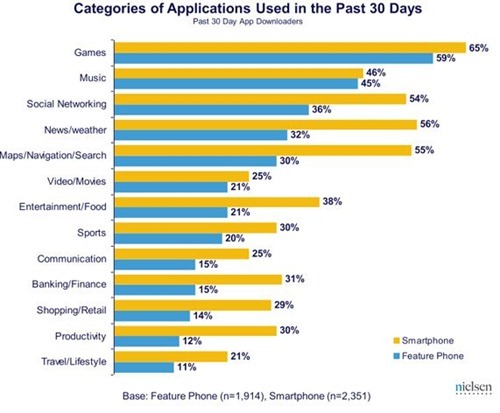 Not surprisingly Gaming, Music, news and social networking were the top mobile app categories. Interestingly, Games and Music are two categories which are most popular irrespective of type of phone – whether feature phone or a smartphone. It is interesting to note that on Android Google Maps is the most popular app that is used, while on all other mobile phones Facebook is the number one app based on usage. yes.thats what i am also asking sir. is this indian mobile data? hi, great info! though I have a question, is this in India or world wide?